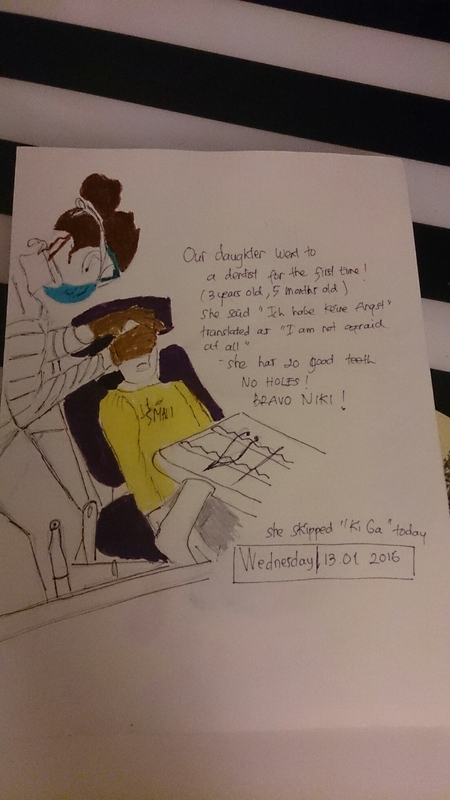 Three days ago, I accompanied my daughter to visit a dentist for the first time. Before the visit, I’d been telling her that soon she had to have her teeth checked by the dentist. She was excited and she kept on asking me every minute (seriously!) when to go to the dentist. On the big day, we went to the dentist, and she bravely sat on the chair there, and smiled broadly telling me that she was not afraid at all! Later, she said to the dentist the same thing ‘Ich habe kein Angst!’. She has 2o pretty healthy teeth, and that means NO HOLES! the dentist asked her whether she brushed her teeth thoroughly, and she nodded fast while smiling. Right after her third birthday, we got a notification letter from the health insurance we are in telling us that our daughter was highly recommended to visit the dentist. Here in Germany,children who turn 3 are highly recommended to visit the dentist.However, it’s not necessarily right after the kid celebrates her or his 3 year old birthday that he or she visist the dentist. One thing to remember is that there are three visitations during the third year until sixth year of toddler life. The next visit idealy, if there are no problems, will be within the next 12 months, and the ‘last’ one will be the year after.The main point of going there as early as 3 is to introduce the importance of having healthy teeth, and in order to have the pretty teeth, one has to know early on the correct way of brushing teeth, the importance of brushing them right after eating. Another main point is to get used to going to the dentist without fear for the sake of the healthy teeth. For children aged from six years old until 17 years old are recommended to visit the dentists twice in year for jaw, mouth, and teeth check-up. Almost in every kindergarten here in Germany has special programs to introduce the importance of keeping the teeth healthy at early age. 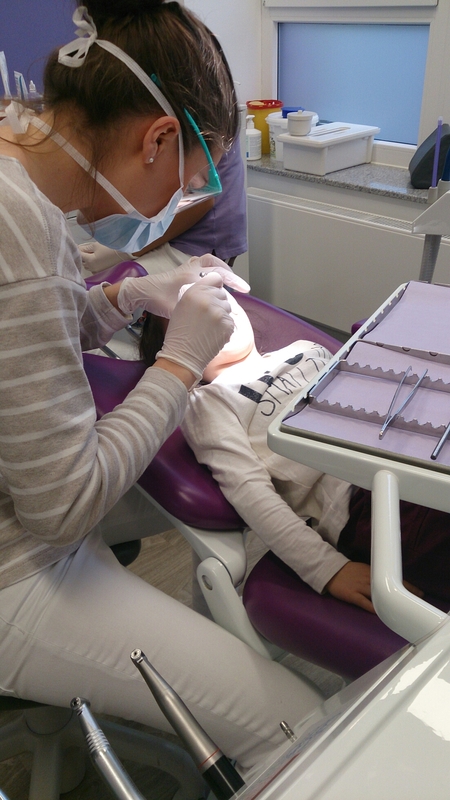 In my daughter’s kindergarten, some visits to the dentists, a visit from a dentist, are some of the special programs. The special programs are also supported by the routine in the kindergarten itself by brushing teeth together right after breakfast and lunch (done in my daughter’s kindergarten). Additional info : I did a quick sketch in order to add to my art journaling photos! wah jadi inget klo terakir ke Zahnarzt tahun 2011 lu. btw bagus ya dia gak takut sama dokter gigi. Waah dah lama! ayo mbak ke zahnarzt lagi cek rutin kayak Zahn reinigung. Iya seneng anakku kesana, dan bangga ama giginya yang bagus gak ada loch nya. iya lagi apply Zahnzusatzversicherung nih lu biar klo ada apa-apa gak jebol dompetnya. lagi memang harus rutin kontrol ya, klo tau-tau parah Krankenkasse hanya bayar sekian persennya aja, sisanya hrs tanggung sendiri. tapi klo punya bukti kontrol rutin gigi tetep sih ada bagian yang dibayar tapi prosentasinya kecil. Iya sih, kita gak apply. Barusan tadi pagi Zahnreinigung, daah banyak Zahnbelagnya, sakiiit dibersihkan, kapok dah! harus extra perawatan, bawa sikat gigi kemana2. Enaknya disini, sekali kontrol terus ya kontrol, dari termin satu ke termin lain.